Technology: Dip Molding Services are plastics and rubber molding services where preheated molds are dipped into vessels of preheated resin. The resin adheres to the mold shape. Higher mold temperatures and longer dipping times create thicker coatings around the mold. 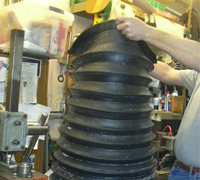 Molds may be dipped multiple times to achieve a desired thickness. After the material has cooled/cured, it is removed from the mold. The process is able to produce intricate parts for relatively low cost. Dip molding of open and closed cell foams, plastisol (a suspension of PVC particles in liquid plasticizer), etc. can produce complex parts over male molds because the resultant product is flexible and so peels away easily from the mold. Dip molding is used to produce a range of multifold products such as bellows. Advantages: Dip Molding Services offer a low cost alternative to injection molding.